From the Los Angeles Times. In the picture, Jessica Griffin, 6 , pulls in the reins during an equestrian competition, with the help of Elsa Caplan and Peter Ruffner. Cathy Sulsona lives in a world where everyone looks down on her in her electric wheelchair. Sometimes passersby look right past her, or have trouble decoding her slurred voice. They see only the cerebral palsy. But when she climbs on her quarter horse, she rises above them. "I feel normal," Sulsona, 43, of Riverside said as she sat next to her horse at Hansen Dam equestrian center. "I'm not looked down on." Sulsona was among about 115 riders at Sunday's daylong Kiwanis Equestrian Competition for Special Athletes. Children as young as 4 competed for ribbons, some in wheelchairs or with prosthetic limbs, others with autism, Down syndrome and learning disabilities. 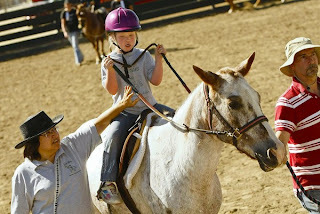 Most of the competitors, including Sulsona, started riding through therapeutic programs that pair disabled riders with coaches and aides, called leaders and side walkers, who help guide both horse and rider. Riders and their families talked Sunday about their struggles to become independent, on horseback and in life. Ivania Lujan's 11-year-old daughter Jessica started riding in August, and already she has noticed a difference. "It's something between the horse and the child," said Lujan, 41, of Whittier. "I see that my daughter is getting more independent." Jessica rides a Welsh pony called Topper with the help of two aides, including volunteer Cheryl Hoffman, who said she has noticed the change in Jessica as well. "It makes a tremendous difference in terms of self-esteem, balance and coordination," Hoffman said. Coaches talked about disabled students whose experience riding horses inspired them to learn to walk, about riders with cleft palates who got the confidence to start talking, and those with learning disabilities who started lifting their heads and hands in class. Sulsona started riding a decade ago at Quantum Leap Farm, a nonprofit therapeutic riding organization in Norco. Her mother, Cathy Sulsona, 63, who works with the disabled and as a foster parent, feared her daughter would fall off, even with four aides standing at her side. "That's what scared me the most — she's so spastic," Sulsona's mother said. "I was worried once she got on the horse, what's going to happen?" Sulsona fell. Then she got back on the horse. Through cold days, when her muscles stiffened, she persevered and progressed. Eventually, she shed her side walkers, then her leader, until she finally was riding solo. That was five years ago. Now Sulsona lives on her own with her Chihuahua service dog Hercules, volunteers at a school for the profoundly disabled three times a week and has her own horse, a mild-mannered quarter horse named Chico who wears a rhinestone-studded harness. She has also dabbled in kung fu, but she still prefers riding. On Sunday, Chico nuzzled Sulsona's neck as she prepared to compete in her third event. Her advice to prospective riders? "You can do anything if you put your mind to it," she said. "If you have the determination, you can do it."